Zest orange and set aside. Transfer blueberries to a pie plate and juice the zested orange directly over the blueberries. Add vanilla sugar and toss to combine. Preheat oven to 200°C/390°F. Cut butter into cubes and add to a large bowl with orange zest. Add sugar, flour, baking powder, and salt to the same bowl, and mix with fingertips until small crumbs form. Add the egg and maple syrup, and mix with a cooking spoon. Distribute large spoonfuls of the batter evenly over the blueberries, but leave some space so that the blueberries are not completely covered. 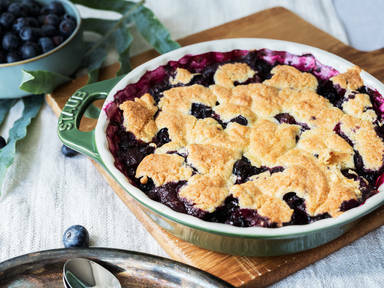 Bake the cobbler at 200°C/390°F for approx. 45 min., or until the top is golden brown. Remove from the oven and let cool for approx. 15 min. Serve with vanilla ice cream. Enjoy!